Peel Stop® is a clear, flexible bridging sealer for surfaces where peeling, flaking, dusting or chalking is a problem. Interior and exterior. Forms a breathable membrane over faulted substrates. Peel Stop® is a clear, flexible bridging sealer for surfaces where peeling, flaking, dusting or ch..MOREalking is a problem. Use indoors or out to form a breathable membrane over questionable or faulty substrates. Peel Stop® tightly bonds to old paint and problem areas forming a sound surface for new paint. Peel Stop® forms a tough acrylic film that stays flexible and helps prevent peeling by letting moisture escape. 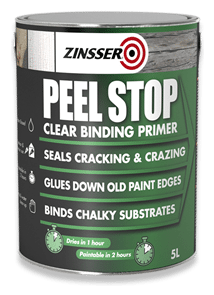 A clear sealer, Peel Stop® works like nothing else to stop peeling problems on old or new surfaces. Peel Stop® is a clear, flexible bridging sealer for surfaces where peeling, flaking, dusting or chalking is a problem. Use indoors or out to form a breathable membrane over questionable or faulty substrates. Recommended uses: Peel Stop® prevents peeling, blistering, checking, cracking and flaking on wood siding and trim, yellow pine, rough sawn cedar, textured plywood, chalking or powdering, concrete and concrete block, stucco and galvanized gutters. Decorate denatured timber effectively requires the right preparation and priming, due to its friable nature. Here we show you how it’s done.